Although Wang Xia has a successful career as a university lecturer in central China's Henan Province, life is imperfect. She cannot bear a child. "I really want to have a child and I've tried several hospitals for treatment but failed," Wang said, adding that she ended up divorced from her husband because they could not have a child. A surgical infection caused her bilateral tubal obstruction, causing her reproductive disability. According to statistics provided by the China Population Association, more than 40 million Chinese people are diagnosed with infertility, 12.5 percent of the total amount of people of childbearing age. The rate was only three percent 20 years ago. The first test tube baby on the Chinese mainland was born in 1988 at the Center of Reproductive Medicine of the Third School of Clinical Medicine of Peking University, where about 1,500 patients every day queue to see reproductive experts. Qiao Jie, director of the center, said many professional women postpone marriage and having a child, which may cause physical over-tiredness and even symptoms such as amenorrhea and menopausal hot flashes. "Their productive ability deteriorates when they eventually want a child," Qiao added. Twenty-two-year-old Xiaoyu, not her real name, had an ectopic pregnancy twice with one of her oviducts being removed. "A careless induced abortion before marriage caused reproductive problems," she said. "I leave all my hope in the operation of the oviduct on the other side." According to Guo Yihong, vice director with the Center of Reproductive Medicine of the First Affiliated Hospital of Zhengzhou University, the number of infertile people is increasing with more than 150,000 patients accepting treatment from the center in 2011. 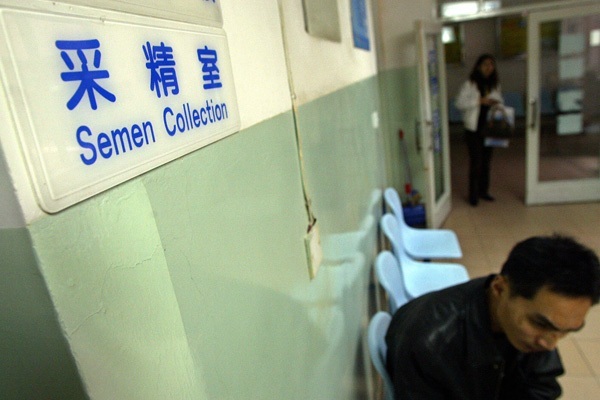 Zhang Cuilian, an expert in reproductive medicine of Henan Province People's Hospital, said that 70 percent of the female infertile and 50 percent of the male infertile was due to poor daily habits. Tubal obstruction and endometrial over-thinness caused by induced abortions is the prime cause for female infertility, Zhang said. Zhang knows of one couple where the woman had 10 abortions during her 20s, thinking that she and her partner would have a child at a later age. However, she could not bear a child when she was 30. Experts also said living conditions may be the cause of infertility, such as street pollution, formaldehyde in newly bought furniture and radiation from daily electronic devices. Staying up late and pressure are other reasons in developing infertility, said Peng Hongmei, associate chief physician of Gynecology and Obstetrics of the Chinese People's Liberation Army Hospital. Peng has witnessed a surge in patient numbers seeking treatment during the last two years. "The prime time for women to bear children is in their 20s to at most 35," Peng suggested. "Giving birth to children at a relative young age will not only increase pregnancy quality but also repress some gynecological diseases." Couples who want children should go to a legal hospital for diagnosis if they have failed to have a child within one or two years, she added.